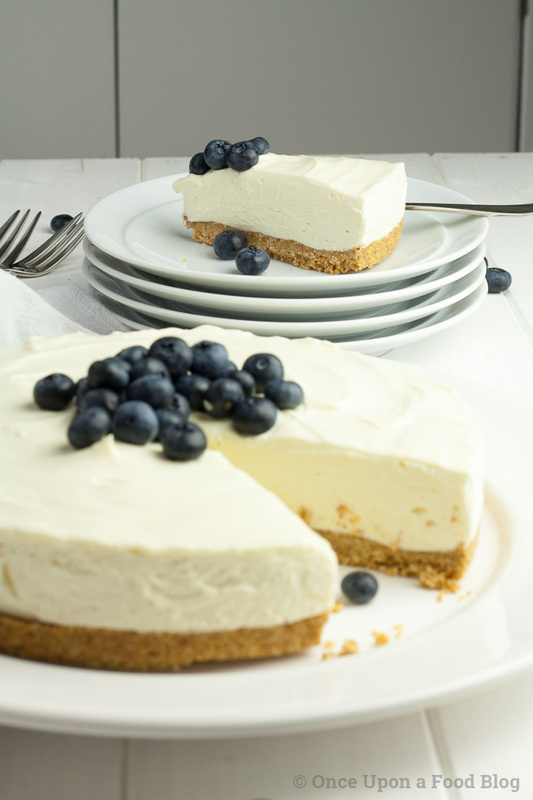 Sweet and beautifully creamy with just the right amount of salty, crunchy biscuit base, this No Bake White Chocolate Cheesecake is a fantastic dessert, perfect for Mother’s Day or even Easter Sunday. 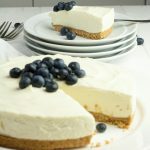 Sweet and beautifully creamy with just the right amount of salty, crunchy biscuit base, this No Bake White Chocolate Cheesecake is a fantastic dessert, perfect for Mother’s Day or even Easter Sunday. I’ve made no-bake cheesecakes before that need gelatine to set. Will this one set? The beautiful thing about this cheesecake is that a perfect set is guaranteed because of the addition of the chocolate. 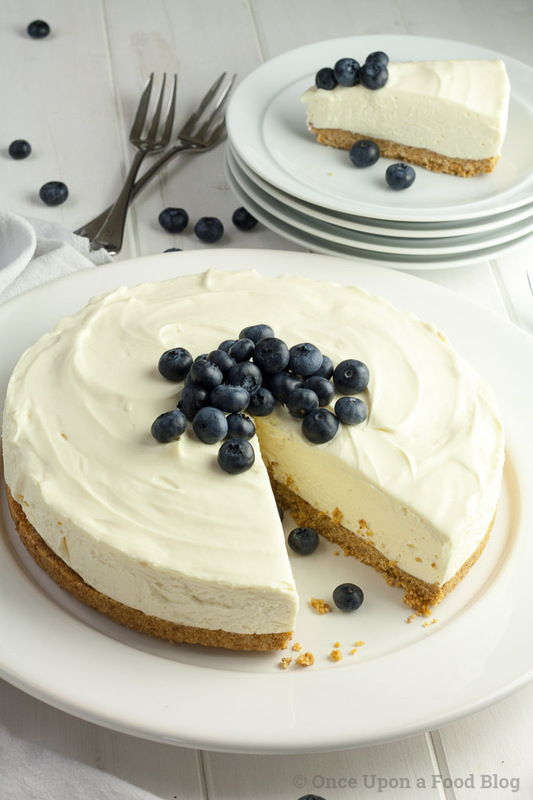 In fact, I’d go as far as to say that you could even use this as a base for other no-bake cheesecakes. Reduce the chocolate by 100 grams, add a tablespoon of icing sugar in with the cream cheese when you beat it and then add lemon zest or perhaps a blueberry or strawberry coulis. You could even try adding in a dash of Baileys – now there’s a thought! Why beat the cream cheese? You need to beat the cream cheese with a whisk to get out any lumps but it’s important not to overbeat it as it may split. Ok, I do admit that this recipe is a bit bowl heavy but if you work smart you can minimise the amount of bowls you use. Firstly, melt the butter in a medium sized pan. You can then stir the crumbs into the butter in the pan which will mean that the food processor just needs a quick rinse out. The chocolate will need a bowl all of its own, but we’ll forgive it that. And if you whip the cream in one large bowl then transfer it to a regular pasta bowl you can then beat the cream cheese in the same large bowl, adding the cream back when ready. And anyway, what are dishwashers/children/ husbands/friends for? Get them to do the washing up. I’m sure they’ll think it’s worth it when they’re served a beautiful slice of cheesecake! Do I really need to line the tin? Feel free not to line the tin but it does make removing the cheesecake much easier and I find it’s the best way to get the cheesecake from the tin without mashing the edges – not a good look! I line the base and the sides of the tin with non-stick baking paper, Christmas cake style. To release the cheesecake from the tin I stand it on an upturned mug then release the spring. The sides of the tin will drop down easily because of the non-stick paper. I then carefully remove the paper from the base and place the cheesecake on a plate. Lastly, I peel the paper from around the cheesecake. Perfect! Can I top the cheesecake with anything I like? Absolutely! Top the cheesecake with whatever floats your boat. I like blueberries because they look pretty but strawberries would also go well, as would white chocolate curls if you are after a real chocolate hit. I’ve recently re-discovered passion fruit, (see my Three Ingredient Lemon Posset with Passion Fruit) and I’m definitely going to give that a try next time I make this. 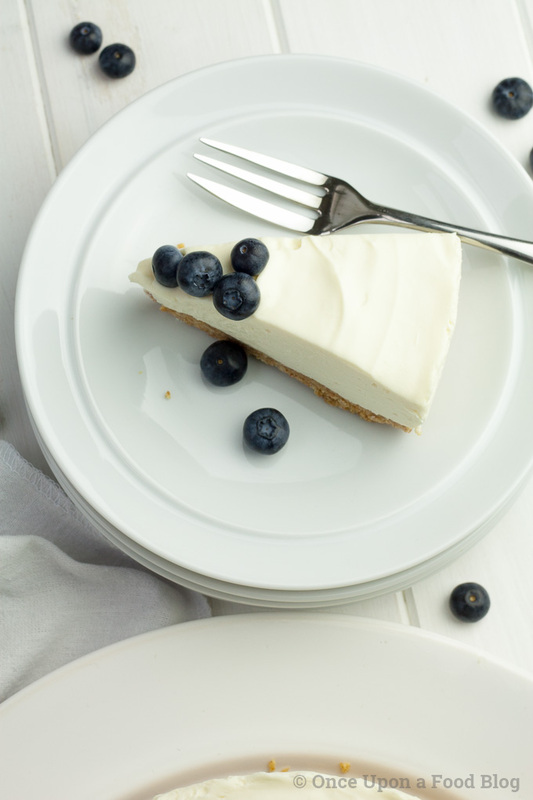 You could even top the cheesecake with mini eggs if you’re making it for Easter. I’m sure that would go down very well! I am making this for Easter. Do you have any other Easter recipes? Absolutely. If mini eggs are your thing then why not try my Cadburys Mini Egg Milkshake? It’s definitely popular in our house. I absolutely love eating lamb and spring is the obvious time to indulge. I will be making my Spiced Lamb Steaks with Rocket and Feta Dressing which I love to serve as a special meal at this time of year and will also be making my Hot Lamb Salad with an Asian Style Dressing at some point as I really love the flavours. Finally, if you’re looking for something to make with the children over the holidays, why not give my Chocolate Bark a go? Start by lining a 20cm (7 inch) spring form cake tin. Line the base and sides with non-stick paper. This makes removing the cheesecake easier. Melt the butter in a medium sized pan over a very low heat. Using a food processor, blitz the biscuits until finely ground. Alternatively, place the biscuits in a food bag and crush with a rolling pin until you have fine crumbs. Stir the crumbs into the melted butter mixing well to ensure all the crumbs are thoroughly covered. Press the buttery crumbs into the tin. Chill. Melt the chocolate in a bowl over a pan of simmering water ensuring the bottom of the bowl does not come into contact with the water. Allow to cool slightly. Lightly whip the double cream until it forms soft peaks. Beat the vanilla extract into the cream cheese until smooth and shiny. Beat the melted chocolate into the cream cheese then fold in the whipped cream. Pour the cheesecake mixture over the biscuit base and smooth the top. Chill for at least two hours and preferably overnight. *Use graham crackers if you can’t get digestives. **I use Milky Bar, but you can use white chocolate chips if measuring in cups. Anna, this cheesecake looks wonderful! 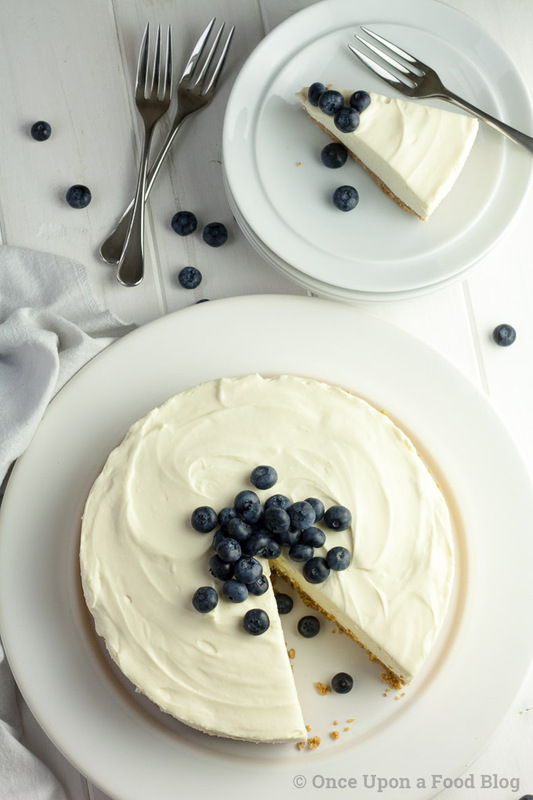 The texture looks amazing and no-bake is so easy. It’s like a canvas to be decorated anyway the imagination takes you. 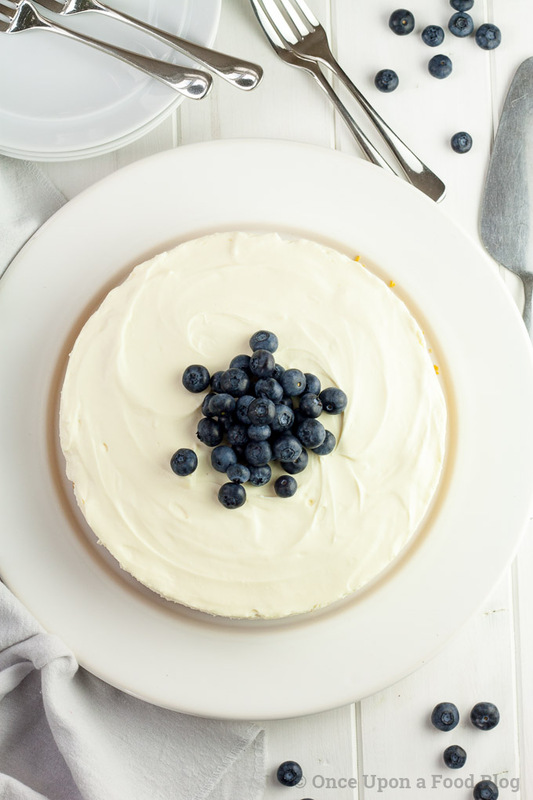 The simplicity of the blueberries is very elegant. Love it! Thanks Kelly, absolutely – go for it! 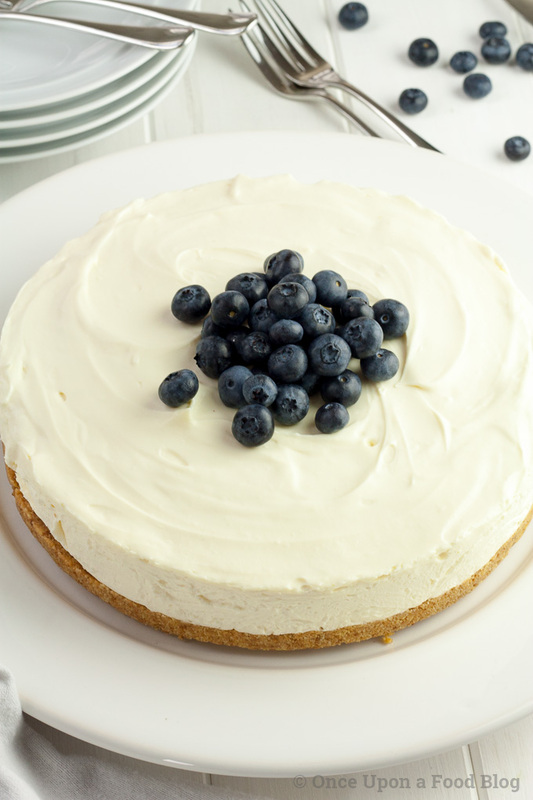 The cheesecake is great for any season as whatever you choose to decorate it with will work brilliantly. your recipes are great and very useful.